What is WIA Scanning Support? Windows Image Acquisition (WIA) is a Microsoft driver model and application programming interface (API) for Microsoft Windows Me and later Windows operating systems that enables graphics software to communicate with imaging hardware such as scanners, digital cameras and Digital Video equipment. It is an alternative to TWAIN, the current image acquisition standard that is used across multiple operating systems. 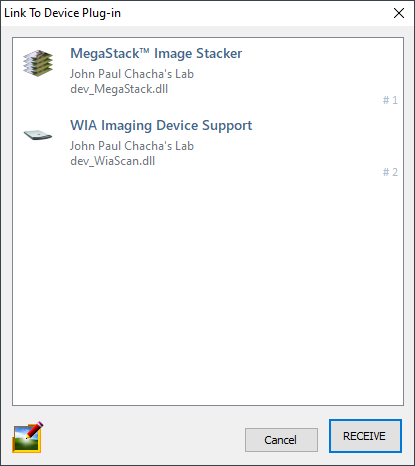 "WIA Scanning Support" is a Chasys Draw IES device plug-in that allows you to use WIA to transfer images from devices like scanners. Please note that Chasys Draw IES can still do this internally using TWAIN without assistance from this plug-in. How do I use WIA Imaging Device Support? To scan images using WIA instead of the default TWAIN support, go to the File menu and select Import from Device. You'll be presented with a dialog box where you can choose the device plug-in you want to import an image from. Select "WIA Imaging Support" and then click "RECEIVE". What happens next depends on your scanner/camera and the driver currently installed for it, but generally, you'll be presented with a dialog box where you can set your scanning preferences.